Sonsie with Ultimate Fit for the Curvy Confident Bride is designed by Veromia’s in house designer – perfect to flatter the curvier bride. 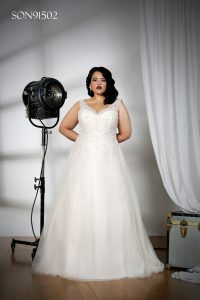 Sonsie dresses are designed especially for brides in size 16 – 32, to fill the gap in the market for gorgeous bridal gowns for the fuller figured bride, these dresses are everything a bride could want in a bridal gown for their special day, from the fit to the colours available and of course the glamorous designs. The Sonsie collection infused the magic of Veromia Bridal adding amazing corsetry into this stunning collection to give the bride a sleeker silhouette and added support. This collection is also available as Special Measure. The Sonsie collection is a multi-award winning collection, and every season it goes from strength to strength due to the gowns having a great fit and inner support for the fuller figured bride. Veromia strongly believe that Sonsie will continue to grow and evolve to ensure that a bride with a fuller figure can have the most beautiful dress on her special day. 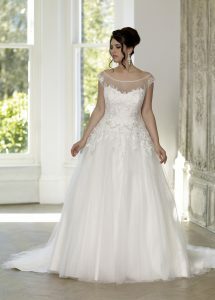 We believe that every bride should “Embrace her fabulousness”.